Thread: Pepperdine has canceled their plans for a new arena. Won't build one after all. Looks like they never really had the money to build a new arena, and are basically canceling building one. Their current gymnasium is the worst in the WCC. Marty Wilson has recruited on the promise that a new arena was coming (look at his twitter - https://twitter.com/MartyWilson4?ref...Ctwgr%5Eauthor). The school aggressively did all the fundraising, focused mainly on the promise of a new arena. Now is keeping the money for campus projects and paying bills instead of doing the arena project. Seems very short sighted. The Pepperdine fans are reacting like the whole arena thing was a big fraud (used to get general fundraising done), and are angry. Not sure how they can argue that 3000 seat Firestone Field house is good enough, after they just raised $500M toward getting a new arena. Maybe the fans will be so PO'd, Pepperdine's admin will rethink and recommit. This school, with proper facilities, could be a regular major player in the WCC. Yeah, we're "The Champs," uh-huh! That pic is embarrassing. The high school I teach at gets more fans out for a JV game. I was watching a televised game between Pepp and LMU a couple of years ago. The crowd was about that thin and virtually silent. During a couple of stretches, the Waves' defense put LMU deep enough into the shot clock that a turnover was imminent. A good home crowd would come alive during those moments. Instead, the broadcast picked up the loudest voice in the gym...a single LMU fan counting down the shot clock to help his team. The home crowd didn't even try to drown him out. Pathetic. Way to go WCC... yet again. It goes to show the arms race in college bb facilities. I think it was about 20 years ago that the Mark Armstead GU team played Pepperdine there in the WCC Tournament final. In those days Firestone Fieldhouse was considered to be one of the best venues in the WCC. Not buying this.... I've been to all the venues except BYU. Pepperdine has air conditioning and a decent gym. Saint Mary's is the worst by far. A cracker box with no air - similar to a large garage. 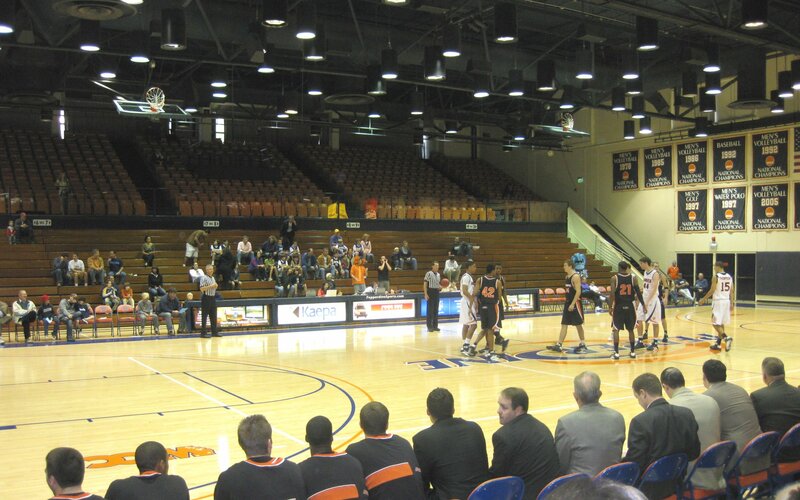 Has anyone heard if Pepperdine is revisiting their plans to build a new arena? I heard they promised Romar that they would build a new arena, but haven't seen anything announced. Was this just another lie on the part of Pepperdine? Their fan forum has almost completely died. No info. Same thing Tetonka; saw a video of Romar after he was hired saying he was told they would build a new facility. I also posted some time ago a post from the BYU board. Got the impression that it was from the Dad of a HS volleyball player (male) that was being recruited by PEP. He stated that he & his son were told by the coaches & AD on his recruiting visit that they were building a new facility. Really embracing for the 'locales' ... seeing how they are mostly Hollywood's finest (?).... lots of cash to throw around and b.s. The graduates themselves make a 'pretty penny'.... know quite a few! I agree with @Kiddwell.... only think lacking is a real "facility and of course a first rate Coach! Yeah, winning cures a lot of ills.